Zero South, a company that popped up at SEMA in 2008, is back again with its Biodiesel Electric Hummer. 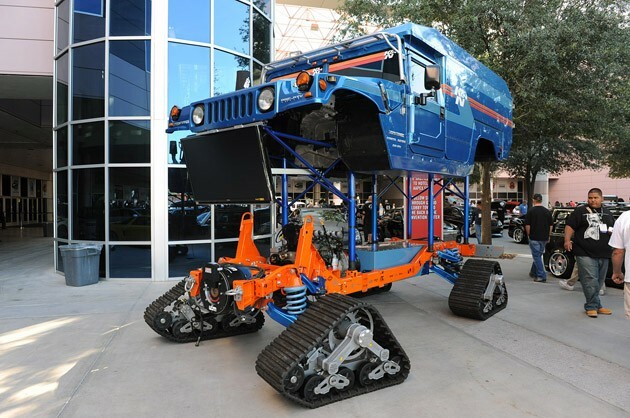 The heavily modified H1 rides on tracks at all four corners – a necessary modification, since this Hummer is designed for an expedition to the South Pole. The trip is going to be documented by Chris Paine, who's best known for the film Who Killed the Electric Car? It was reported back in 2008 that the vehicle was going to be driven by Buzz Aldrin and Apple co-founder Steve Wozniak. The film is called Drive Around the World and was shot in 3D. Drive Around the World is also the name of an organization that works to inspire an urge to explore while raising money for various charities. The H1 shown above is Zero South's vehicle for participating in these expeditions. The Zero South Biodiesel Electric Hummer was originally setup to run on B99 fuel, but Jay Leno joined the team and modified the powertrain so that a four-cylinder diesel Volkswagen engine would act as a generator to four electric motors. Each motor would then provide power to the individual track it's coupled to. It's one heck of a Hummer, and we invite you to check it out for yourself in the gallery below.